Check the remarks by Professor Blois and Professor Evans on the Russian Golden Age. Professor Joseph Frank worked for over twenty-five years to publish his definitive, five-volume biography of Dostoevsky (Dostoevsky: The Seeds of Revolt, 1821-1849; The Years of Ordeal, 1850-1859; The Stir of Liberation, 1860-1865; The Miraculous Years, 1865-1871; The Mantle of the Prophet, 1871-1881), truly a magnificent work. Read some of Frank's reflections on his long, and continuing, study of Dostoevsky in *.doc or *.pdf format. For 50 points Maximum extra credit, Watch Anna Karenina (1967) and write a one-page paper about why your instructor thought that the film was so bad. For 50 points maximum extra credit, watch Voina i Mir (War and Peace), if you dare. Watch instead Love and Death (1975), and write a one-page paper assessing Woody Allen's portrait of Russia in the age of the Napoleonic wars. For 50 points maximum extra credit, compare and contrast the work of the mighty three (Tolstoi, Dostoevskii and Turgenev) in a one-page paper. This might be worth a lot more depending on how good your comparison is; I might accept longer than one page on this. For 50 points maximum extra credit, in a one-page paper, identify some of the unifying traits of the work of the Mighty Five (Milii Balakirev, Cesar Cui, Modest Mussorgskii, Aleksandr Borodin and Nikolai Rimskii-Korsakov). For 50 points maximum extra credit, identify some of the salient characteristics of the work of Ilya Repin and the Peredvizhniki in a one-page paper. For 50 points maximum extra credit, read Lev Tolstoi (1828-1910), Anna Karenina (1873-78) and write a one-page paper about his critique of Russian society. For 50 points maximum extra credit, read Lev Tolstoi (1828-1910), Death of Ivan Ilich (1882) and write a one-page paper assessing Tolstoi's criticism of Russian society. For 50 points maximum extra credit, read Fedor Dostoevskii (1821-81), Crime and Punishment (1866) and write a one-page paper, Why was this the "true" Russian novel. 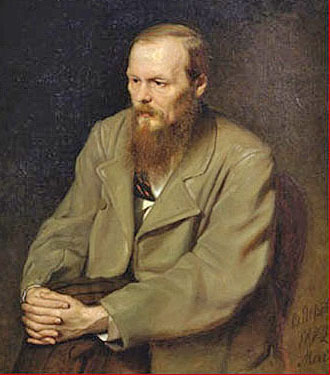 For 50 points maximum extra credit, read Fedor Dostoevskii (1821-81), Idiot (1868) and write a one-page paper in which you explain why this is Professor Evans' favorite Dostoevskii novel. For 50 points maximum extra credit, read Fedor Dostoevskii (1821-81), Brothers Karamazov (1878-80) and write a one-page paper, "Who was the Grand Inquisitor?"